Photo: Ovide Broussard House, ca. 1899, 309 East St. Victor Street, Abbeville, LA. Listed on the National Register of Historic Places in 1995. Photographed by user:Jerrye and Roy Klotz, MD, 2008, (own work) [cc-by-4.0 (creativecommons.org/licenses/by-sa/4.0/)], via Wikimedia Commons, accessed June, 2015. Vermilion Parish administrative offices are located at 100 North State Street, Abbeville, LA 70501; phone: 337-898-4300. 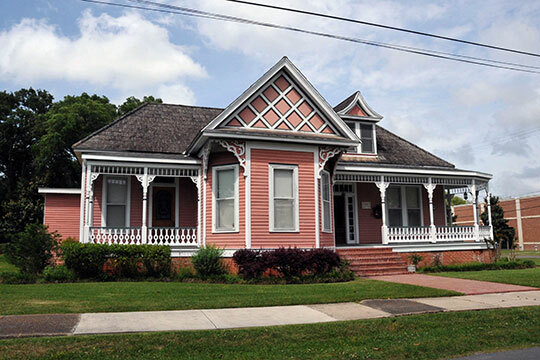 Located along the Vermilion River and bordering the Gulf of Mexico in an area known as the French Triangla, Vermilion Parish was incorporated in 1844.